A little bit edgy and pleasantly surprising, industrial style furniture makes for an interesting display. Industrial style enhances the visual appeal of the minimal, the slightly worn, the raw and the unfinished. Industrial furniture offers strong clean lines with no excess. It is a mixture of solid wood with metal accents that allows the old to be new again. Part of the appeal lies in the aged look of the furnishings, revealing a beauty in a basic, strong structure. Re-purposed materials are popular for industrial design furniture and the earthy raw look that it produces. 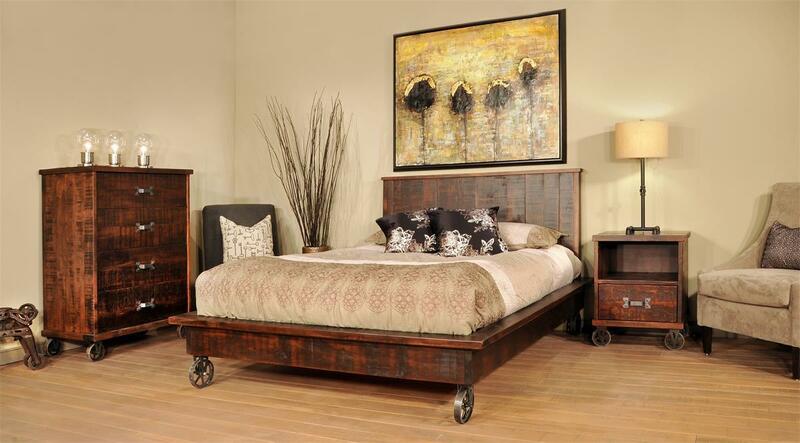 Explore our industrial bedroom furniture and our industrial style furniture for your dining room display. Amish made furniture supports an industrial style with ease, featuring solid wood selections that will make a lasting impression.